Last year this time we were in Italy, so we decided to recreate the wonderful breakfasts we enjoyed there: chocolate and almond croissants from Trader Joe's (surprisingly good! 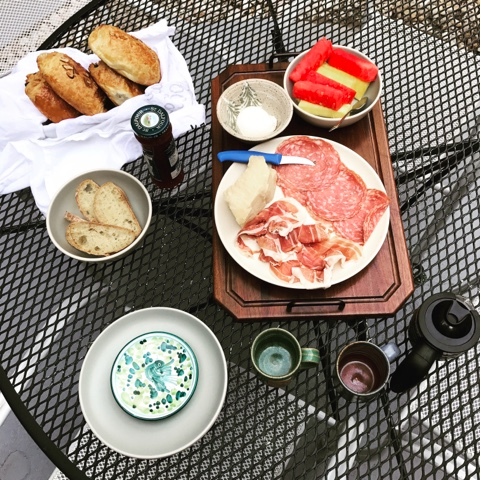 ), Prosciutto di Parma, soppressata, Parmigiano Reggiano, buffalo mozzarella, bread, jam, fruit, and espresso. Glorious! Definitely a splurge, but so worth it. Because I bought far too much meat and cheese, we had plenty of leftovers. 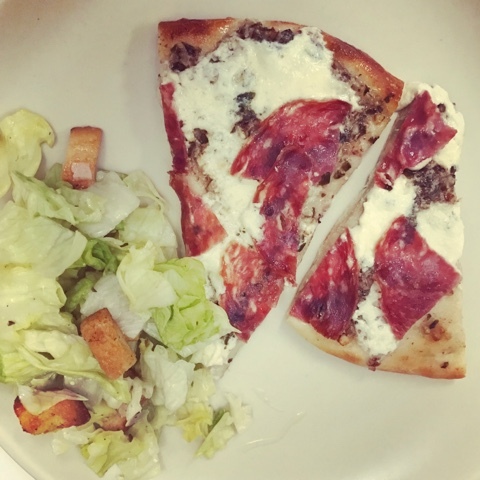 We used some of them on the pizza below, which has homemade basil-pecan pesto, buffalo mozzarella, and soppressata as toppings -- so good! 1. Place the nuts and garlic in a food processor or mini chopper, and process until they just start to break down. Add the cheese and pulse another few times. 2. Add the basil and pulse a few times. Then add the oil, lemon juice, and salt, and pulse until the pesto is as chunky/smooth as you like it. Taste and add more of anything to make things taste perfect!